Thank you to Jason for this article detailing his rebound NABRE. If there was ever a translation that deserved a premium edition, it would be the NABRE. I was received into the Catholic Church in 2006. Prior to that, I was very active in a conservative Baptist denomination. 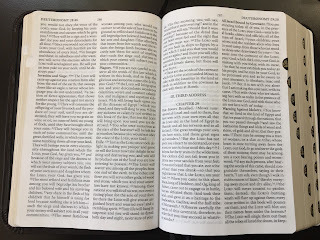 As readers of this blog are all well aware, the pride that conservative Evangelicals take in their Bibles and the hearty response the resulting demand elicits from publishers lead to easy availability of all kinds of high quality Bibles. After I entered the Church, I quickly realized things were much different on this side of the Tiber. I looked for some time for a quality Catholic Bible, ultimately settling on the (now out of print) Oxford/Ignatius RSV-CE Reader’s Edition. I used that Bible for years, but as happened with many of them, the binding began to pull apart at the pastoral epistles. Also, although that Bible was pretty good, it had no content at all other than the Ignatius Bible notes, a few prayers, Dei Verbum, and the Biblical text. It had no cross-references or other study helps, and the print was quite tiny. A couple of years ago, I discovered this blog, and what a wonderful find it was! I actually went back to the very first post and, over several weeks, read through every post until I caught up. 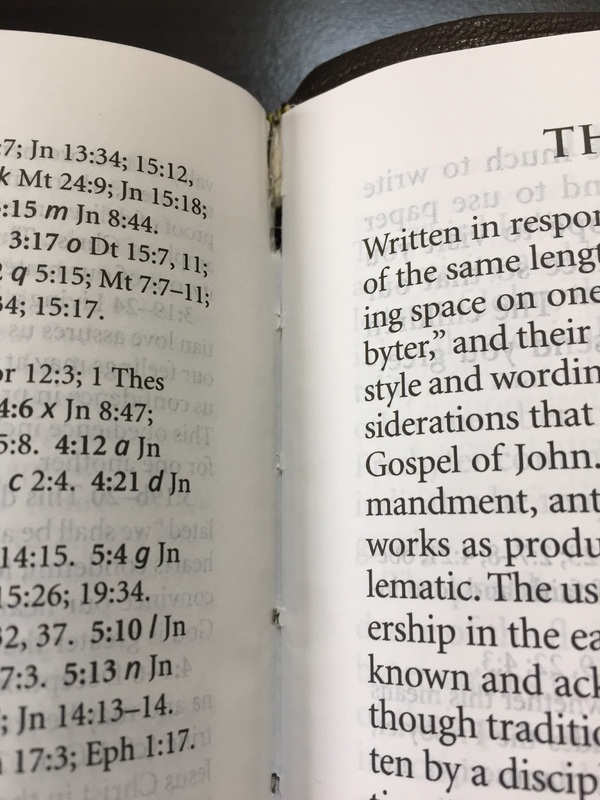 In the process I discovered that my frustration with the lack of quality Catholic editions of the Bible was shared by many, but I also came across reviews of some Bibles I did not know existed. And I learned of the possibility of taking a decent book block and having it rebound to produce a premium Bible. This was not an option I had really heard about before. Through a review on this blog and through discussions with Timothy and Rolf through Facebook, I became intrigued by the Oxford NABRE Large Print. It has a genuine leather cover, which is good, but it is the same hard, durable but not very pleasant, leather found on the RSV-CE Reader’s Edition. The layout, however, is quite good. 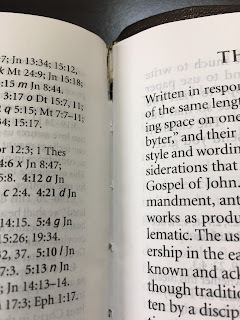 The print is 12-point, and the NABRE notes and cross-references are in the back of each book, as opposed to on the page with the biblical text. I ordered it and, after reading from it for a month or so, decided this would be my main daily reading Bible and the object of my first rebinding adventure. From this blog and from the Facebook groups many of us frequent, I was of course familiar with Leonard’s. I considered sending this Bible to them, but I also loved the fact that a number of young men were taking on Bible rebinding as a trade and a ministry. Diego Caloca and Jeremiah Frost are two examples, and I really wanted to support them in their efforts. I corresponded with both and ultimately settled on Jeremiah (Diego was simply very busy and it was going to take longer; there were no other concerns at all with him). A few weeks later, I had my Large Print NABRE returned to me bound in a wonderful black goatskin with four black ribbons (I wanted to be able to mark Psalms and Wisdom lit, other OT, NT Epistles, and Gospels; that tends to be how I manage my devotional reading and prayer). I loved almost everything about it. The goatskin is some of the softest and most pleasantly aromatic leather I’ve ever encountered (with the caveat that my experience with leathers is somewhat limited). It is simply a pleasure to hold and to read from. And having a Bible that has some personally chosen features, such as the four ribbons, really enhances my feeling of attachment to it and my desire to read from it. I did immediately have one concern. 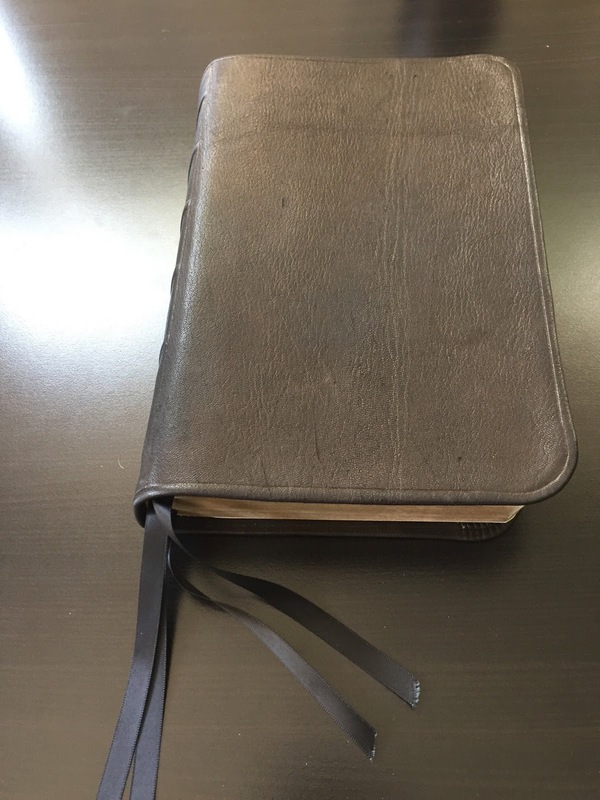 I’m not sure if this is minor or major, since I have no other experience with having a Bible rebound. As you can see, I hope, from the photos, the edges of the cover are a bit too short. This causes the edge of the endpapers to get caught in the folds of the leather. I’m not sure how serious this issue would become be over time, but it has already caused some wear on the edges of the endpaper. Beyond that, however, I was extremely pleased with Jeremiah’s work, and would recommend him to anyone else wanting to support this new generation of rebinders. Now for the rather sad ending to my story (or latest chapter, anyway). For the past few months, I have been enjoying this Bible immensely. I love the size of the print and having the notes and cross references in the back of each book, easily available but not a distraction while reading. This was a Bible I could read from for years, at least until the NABRE NT revision is published. And then, a few days ago, I noticed the last signature in the NT was separating from the book block. I don’t think the fault for this lies with Jeremiah; this seems to be a common problem with Oxford. It is the exact same problem that plagued the RSV-CE Reader’s Editions I mentioned above. I have owned two similar, but not identical, Bibles published by Oxford, and this has happened to both of them. It’s hard to believe that’s a coincidence, even if one of them was rebound. At this point, I am simply not sure what I’m going to do. Given what has happened, I have my doubts about the quality of the book block, but I may send it to Leonard’s to have it repaired. It certainly is one of my favorite Bibles to read from. Any advice would be appreciated! The quest for a quality, long-lasting Catholic Bible continues! "And then, a few days ago, I noticed the last signature in the NT was separating from the book block." I modified that method a little though. This is what I did. I grabbed a piece of wax paper (you want it to be able to extend over the top and bottom of your book). Fold it in half and insert it into the spot where the damage is. Add a bead(thin line) of glue to the crack in the book. Alignt the wax paper about 1/16-1/8" away from the crack where you glued. And close the book. Basically the reason for the wax paper is to prevent glue from getting on more of the page than is necessary. I've done the same as Brandon, many times, and as long as you take your time and are careful, it works. It beats spending an inordinate amount of money sending it away. The only difference is that I typically use a thin book and put it between the glued pages, away from the line of glue, to ensure that the pages are completely separated where the text begins (and so don't stick together), but the wax paper idea sounds good, too. Then I place a couple of heavy books on the Bible and let it dry. It's worked like a charm for me. Unfortunately, in my experience, it's rare to have a Bible not eventually start to come apart like that, no matter how good the stitching is. Bibles typically have a lot of signatures, and I think the weight of them places a heavy burden on the spine. Thank you for the advice. I may try something like that, but I'm horrible with detail work and I'm a bit worried I'd make a mistake and then be frustrated that I'd ruined it. I know that often Bibles do start to separate like that. If mine had done this after several years of regular use, it would make sense. But I just bought this Bible in October and had it rebound in December! Jason, I had bought a Oxford Catholic Study Bible when the new edition had come out in 2006, had it a week and the whole rear signature section containing the maps completely fell out of the Bible when I picked it up. It was a hardcover. I also have had a couple of other Bibles over the years start to seperate. 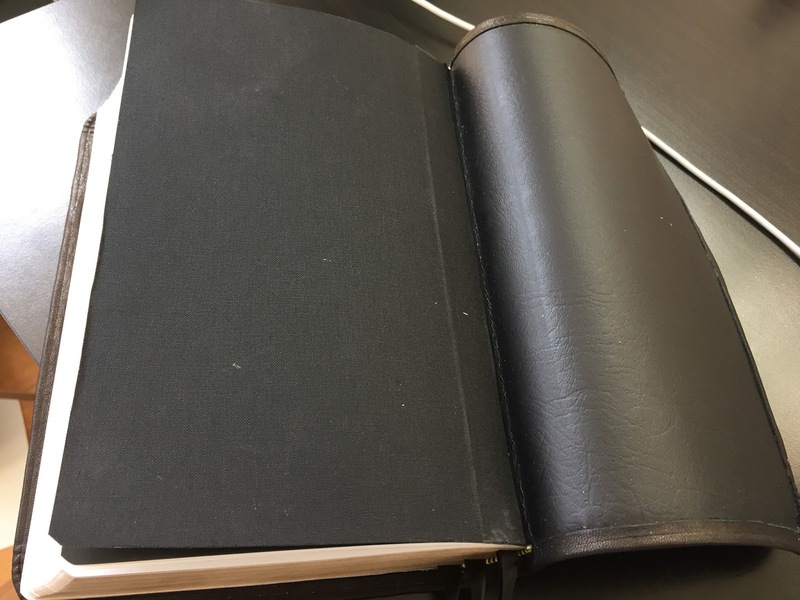 I just bought an Oxford-Cambridge REB in genine leather on ebay for $25.00 in like new condition with one problem, the synthetic paste down liner the secures the book block to the leather cover is starting to separate at the spine. This is not from use, the Bible looks like new! Wow, Rolf. Oxford really needs to get their act together! I've found it hit or miss with Oxford as far as quality goes. Especially with the hefty volumes, like the NOAB 4th edition, concerning the signatures splitting apart in the front and back. 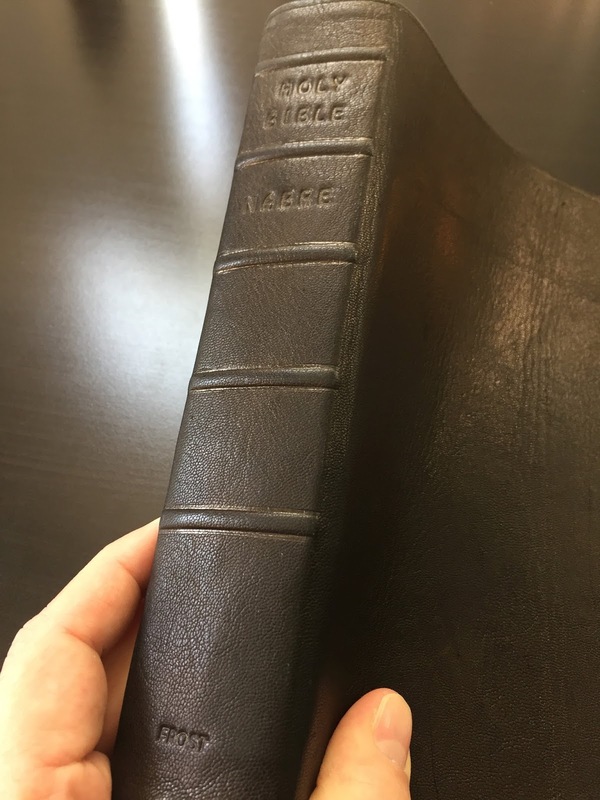 My large print NABRE- gen. leather doesn't seem near the quality as some of my older Oxford Bibles. The leather is genuine, but it doesn't seem the same quality of many of my Oxfords. Several of the Oxfords had spine issues way too early on, too. And Rolf, it makes me sick that you found the REB genuine leather for $25. If I shared what I paid for mine, in Berkshire leather, on ebay as well, you'd laugh hysterically and thank God for your good fortune. Ouch. I mean, mine is beautiful. But ouch. Leighton, I am having my Cambridge (with deutrocanonical/apocrypha books) rebound in calfskin by Abba. I saw this for sale not auction for $25.00, so I acted quickly! The problem is it does not have the deutrocanonical books, which I forgot to check in my rush to buy it... So it will be a backup. I should add that the Cambridge REB has a thicker leather (french morocco)cover and feels better to the touch than Oxford-Cambridge REB' genuine leather but the reason that I am having it rebound is that it is very stiff and has not broke in after years of use. The Oxford-Cambridge is a thinner cover (typical of many Oxford genuine leather covers), shinny and a little slippery. Very nice! I wonder... has anyone had the Ignatius RSV-CE New Testament and Psalms rebound? 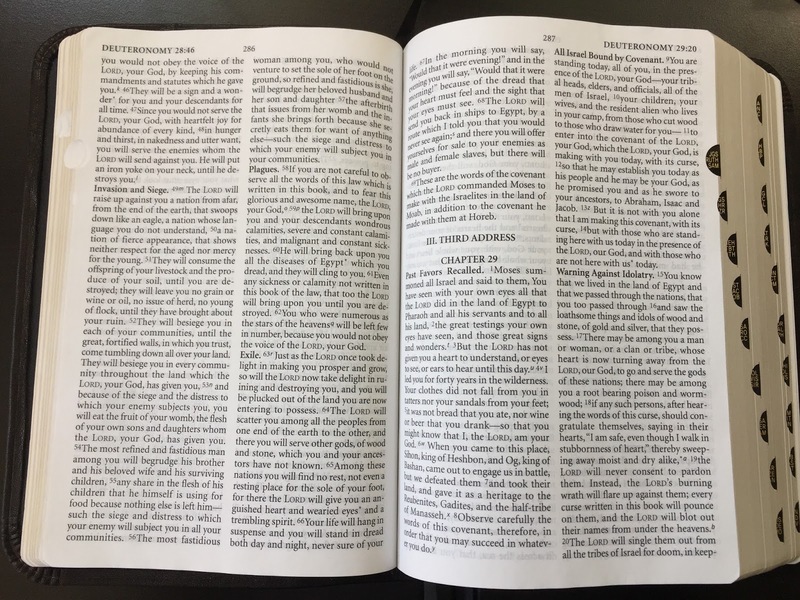 I've heard negative comments on some of the newest Oxford bibles, so I purchased a 20 year old slightly used example (I don't think it was read at all.) Cost was a factor, of course but when you see a lot of negative reports, you know quality control is a problem. Here's a good example of a rebound Ignatius NT & Psalms. Thanks for the link JDH, I'll check that out! Which Translation of the Bible is the Best?